Japan is now considering future weapon transfers to other Asian countries as it builds alliances for a potential war with China. 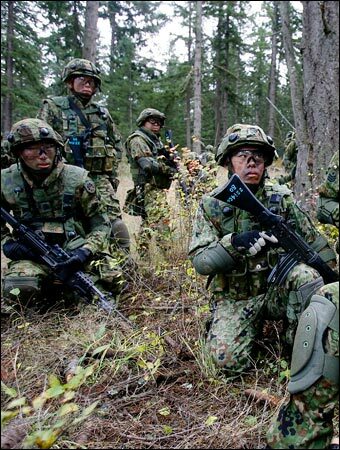 Soldiers of the Japan Ground Self-Defense Force training in Oct. 2008. Earlier today in Okinawa, Japanese officials met with representatives from the 10 member states of the Association of Southeast Asian Nations to expand technological and defensive cooperation between the countries. As part of Japanese Prime Minister Shinzo Abe’s plan to “deepen and enhance cooperation” with ASEAN, a ministry official told Kyodo News that Japan is currently looking to ease its policy on arms exports, a clear indication that the island nation is taking the threat of war with China seriously. “China appears to be at the forefront of Abe’s defense vision, bolstering the case for Japan to strengthen ties with ASEAN,” the newspaper reported. ASEAN consists of Indonesia, Malaysia, the Philippines, Singapore, Thailand, Bruei, Burma, Cambodia, Laos and Vietnam. In December, a former Chinese Ambassador to the United Nations, Sha Zukang, said that the current territorial dispute between China and Japan over the Senkaku Islands could lead to World War III. The dispute flared up in November when the Chinese government announced it would enforce air traffic restrictions inside a self-declared Air Defense Identification Zone which includes most of the East China Sea. The controversial Chinese ADIZ not only overlaps the ADIZs of Japan and South Korea but also includes the Senkaku Islands, the aforementioned territory in dispute between China and Japan. Amid these rising tensions, Japan is revising sections of its constitution which limits its military activities. Additionally, Japan is reportedly ramping up nuclear weapons capabilities as reported earlier by Paul Joseph Watson. China, on the other hand, plans to build four aircraft carriers in the next several years, including at least one that is nuclear powered. The Chinese military also recently developed a more advanced ballistic missile which is capable of striking anywhere in the Asia-Pacific region, according to the Want China Times. The United States is already involved in the territory dispute and a group of defense analysts warned lawmakers in December that the U.S. should also plan for war with China.